After 7 years of ownership, and many wonderful cruises, the decision to sell our Hunter 39 was made easier with the support and help of Massey Yacht Sales and Services. From idea to reality, they worked with us, not just for us, as partners in the sale. Massey provided us excellent information to support our comp value and advised us on market trends in order to set both an accurate and realistic sales price. Not only did we begin with the most up to date information but Ed kept us at the top of his list providing marketing suggestions that would maximize our exposure to those wishing to purchase. We had great pictures and listed all the options in detail so that the information on Yacht World’s website was timely and accurate. This gave potential buyers a clear picture of what we were offering so that the potential buyer had more information moving forward with less back and forth needed. It was also apparent in the pictures that we loved our Hunter 39 and she was well cared for. Ed featured our boat during their weekly staff meetings, so the Massey sales team was well informed for showing our boat and providing feedback that we needed to move a sale forward. Alice did an excellent job of keeping us informed on the paperwork involved in the sales process, so we had no issues or delays up to and including the closing process. 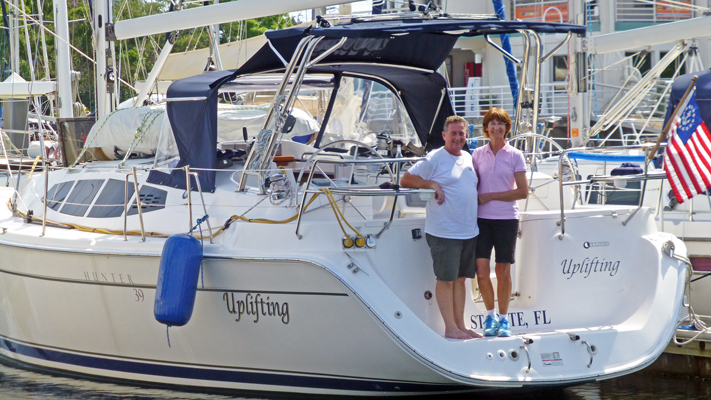 As we venture onto land cruising, we will miss our sailboat, but the process of letting go was made easier by the professionals from top to bottom at Massey Yacht Sales. For purchasing or selling, Massey Yacht Sales was amazing and deserving of the highest recommendation. It was a pleasure to do business with them.